Laughing Dog | Beer Apprentice - Craft Beer News, Reviews, Interviews and Info. 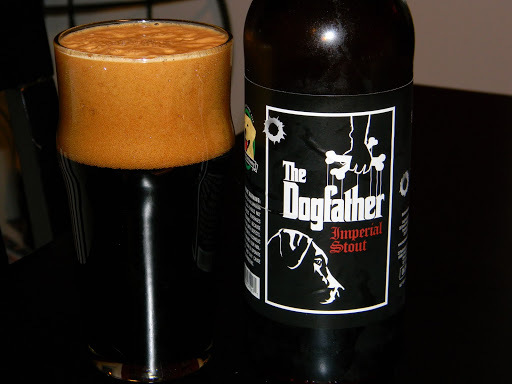 “I’ve got a brew You Can’t Refuse.” The Dogfather is one of the biggest brews we have made. Weighing in at a hefty 11% ABV, the Dogfather has 7 malts and 4 different hops giving it a complex flavor profile. Over 11 months in the making. Some of the Dogfather is bourbon barrel aged. This is a very limited release for the first of November, Get it before it’s gone! This beer came in a 22oz. bomber and the label stated that it was in fact 10.85% ABV as opposed to the 11% mentioned on the website. No matter, it’s still a BIG beer!!! This beer poured a very, very, very dark brownish/black color with only the most faint ruby highlights at the very bottom of the glass when held directly toward the light. With an easy pour, it still produced a very dense, creamy, frothy, dark tan head that had tremendous size, near perfect retention and outstanding lacing. The aroma revealed some very dark fruit scents reminiscent of dried raisin and prunes. It brought forth an almost “fruit cake” type smell that was more than pleasing. Coffee and chocolate notes made an appearance, but were kept on the mild side. The dark malt provided more of an “earthy” and “woody” tone than what I had envisioned. A Bourbon nose was present, but it actually seemed to be held back a bit considering it’s high percentage. The flavor revealed more of the coffee and chocolate malt than the smell did, however the dark fruit is hanging around in a more subdued way. A bit of chalkiness was exposed while the Bourbon definitely let itself be known more so in the taste. The mouthfeel was medium to mostly full bodied and very dry. A very noticeable alcohol burn came through at the back end of the drink that lingered on the palate for quite sometime. I was surprised at how smooth this beer was taking into account how high the ABV measured. It wasn’t harsh or distracting, but rather welcoming. I’m usually not a big fan of over the top beers. I like to taste more ‘beer” in my beer than alcohol, but this one is an exception. Obviously, this brew is a “sipper”, however it went perfect on the absolutely blistering, cold night that I sampled it. The alcohol burn took a few sips for me to get used to, but as I continued, I thoroughly started to enjoy it. It’s definitely worth a try if you favor Stouts. It was a tremendous looking beer with a strongly supported smell, taste and mouthfeel. Crafted and balanced well enough to satisfy most any craft beer drinker. Please let me know what you think of this beer in the comments if you have tried it. Thanks for reading.